Easily accessible, and only three hours from London and the Midlands, Lyme Regis is away from it all, nestling in the unspoilt West Dorset countryside. Part of the Jurassic Coast World Heritage site, and surrounded by areas of Outstanding Natural Beauty, Lyme Regis, the "Pearl of Dorset", is famous for its fossils, its historic old town, its Cobb and its beaches. Many of the earliest discoveries of dinosaur fossils were made in the 1820s, around Lyme Regis and Charmouth. The sequence of Triassic, Jurassic and Cretaceous rock formations in the cliffs still make them one of the best geological sites in the world for education and research. Lyme Regis has a special place in literature, as the setting of popular works such as Jane Austen's Persuasion and John Fowles's The French Lieutenant's Woman. A little out of Lyme Regis is the Undercliff, one of the earliest national nature reserves. The landscape from Portland to Torbay is some of the country's most scenic: the South West Coast Path passes along it and over the Golden Cap, the highest point on the South Coast, which is protected under the ownership of the National Trust. From its unspoiled cliffs on a clear day you can see right across the bay to Dartmoor. As far as protected terrestrial landscapes are concerned, Lyme Bay has it all. 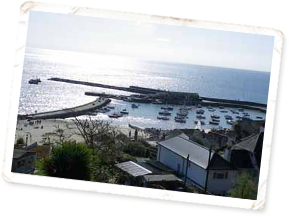 For further information about visiting the area, visit: www.lymeregis.org.